Home » Tutorial » Happy Birthday to Ewe! 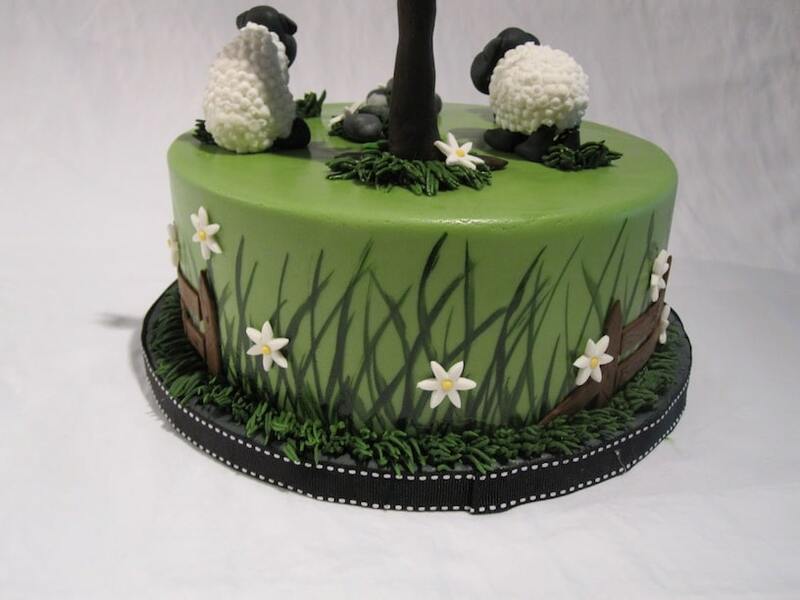 Here’s the final creation… using the sheep, the tree, and the cake covered in white chocolate ganache. I’m so happy with the way this turned out! I got the idea for this cake from various ones in the galleries on http://cakecentral.com/.I made this cake for a very good friend of mine… it was her boyfriend’s birthday and the sheep things is a bit of an inside joke between them. It’s also one of my very first cake orders! Note the $10 wooden lazy susan from IKEA that works awesome as a turntable! 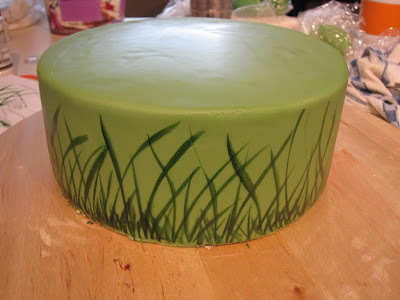 The side i started out on (the back of the cake) was not as good. I used Tappits to make the letters. 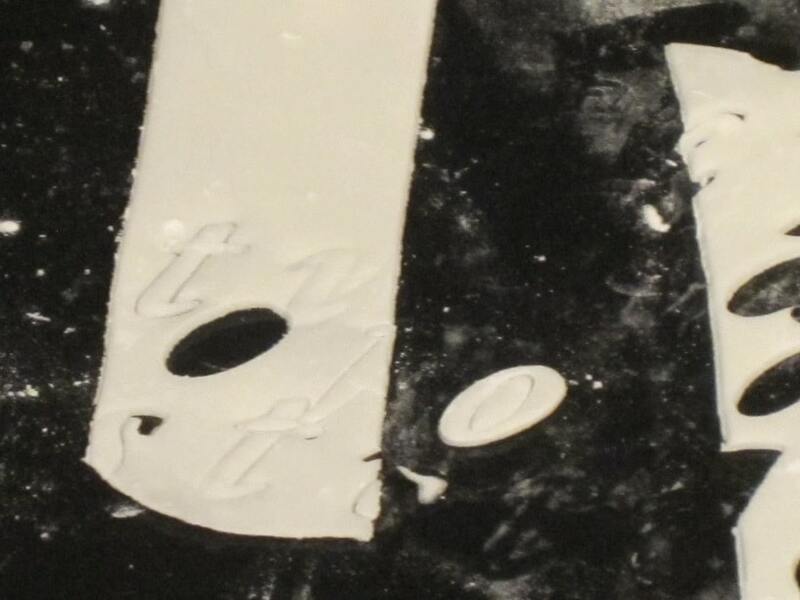 Make sure to use cornstarch/powdered sugar on the surface and the tappit so that it’s easier to get the letters out. I found that rolling the gumpaste a bit thicker than recommended made it easier to handle and remove. At times I had to pry the letters out of the tappit with a toothpick if they got stuck, but the still turned out really well. A bit blurry/messy but you get the idea. 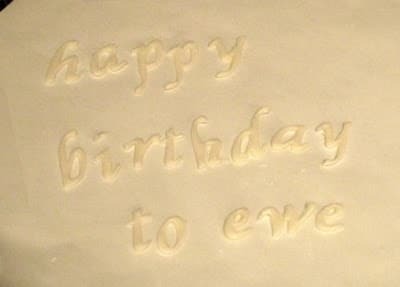 I let the letters dry before attaching them to the cake, but only because I did this part in advance. You don’t need to let them try before attaching them with gum glue. 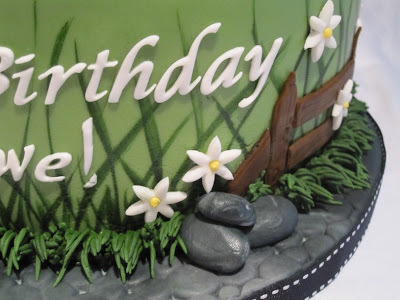 I finished the cake off with some white gumpaste flowers, a fence, some rocks, and some royal icing grass to cover the bottom edge. It took *forever* to get that green color for the royal icing. I swear I used over half of the color gel I had! 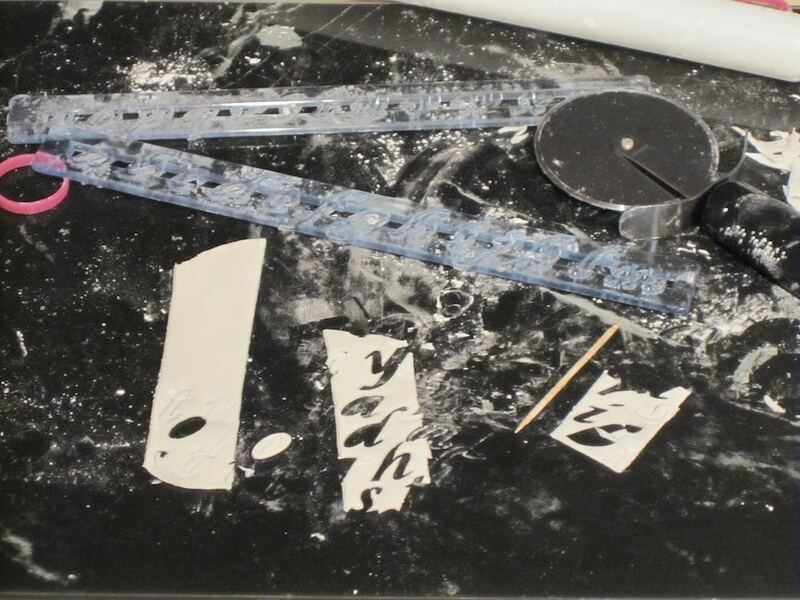 The cake board and rocks are made from marbling white, black and grey fondant together. For the board I used a cobblestone impression mat once I rolled out the fondant. 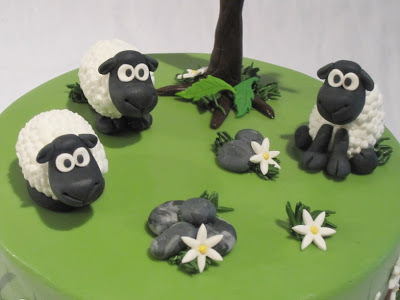 Have I mentioned how happy I am with how the sheep turned out?? LOVE them! I have a question regarding the use of tappits. 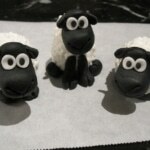 I used them recently with black fondant. First I tried to liberally use the icing sugar so that the letters would detach easily but, it “dirtied” the fondant. What can I do in the future to obtain the desired effect of the icing sugar without spoiling the fondant. Thanks for any suggestions. It’s been a long time since I used tappits, but I remember in general that you can clean powdered sugar off of dark fondant with a small paint brush dipped in vodka. 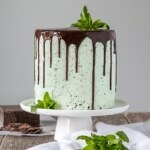 I am a very new hobby baker and like to challenge myself with new recipes. This cake will be swiss meringue butter cream with the accents. They do not want a cake in fondant. I love that you covered the cake in ganche. I have only used ganache to fill or to pour on top. Hi Ann Marie! 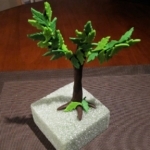 Gumpaste is totally edible, it just dries harder than fondant. Either would work just fine though :). I am so very intrigued as I have read more of your blog. 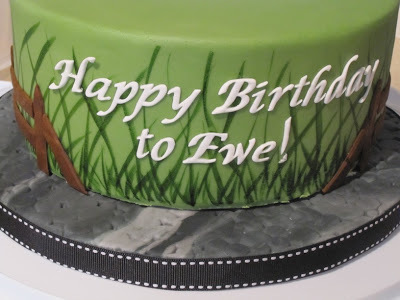 I believe that you used the white ganache to cover your ewe cake, then covered that in SMBC? My girlfriend does not want fondant at all for the cake. As mentioned above I was going with SMBC and add the accents onto that. 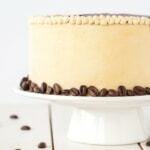 I love the idea of ganache first then the icing. 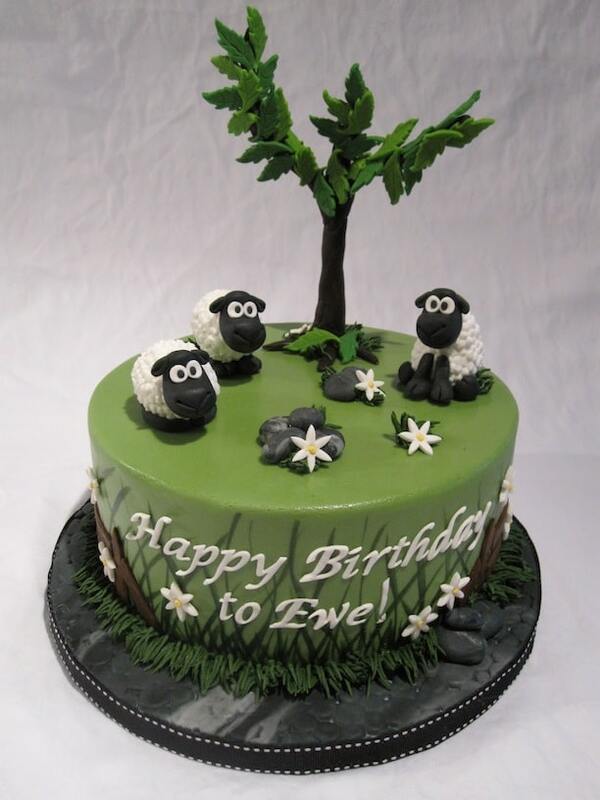 Is this how your ewe cake was so perfectly clean? Hi Ann Marie! 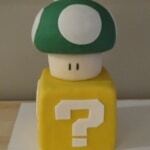 I used ganache and then fondant over top. I would skip the ganache and just do SMBC or just do ganache. You can get a very smooth surface on the SMBC if you chill it until it’s firm then go over it with a hot offset spatula or bench scraper (run the spatula under hot water and dry it off). 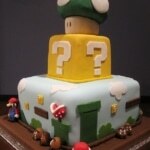 What a cute cake!! And your others look great too! Hope to see more soon! 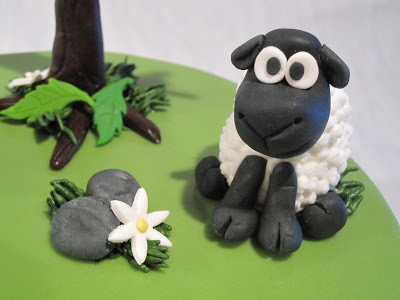 You are a very talented cake artist! 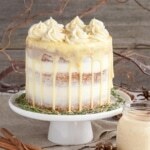 I hope you are still baking and I would love to see some of your latest creations here on your blog! They really are little darling sitting on top of your cake – and i appreciate the time it took for you to make each and every one. The cake is just gorgeous. Do hope you shall be back soon with another creation – as your work is lovely. 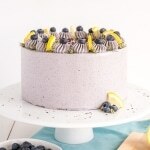 This cake is fantastic! I love everything about it. It is a beautiful shade of green with the most ADORABLE sheep and the side paintings is great! Thank you both! I’m really happy with the way this one turned out :).